Cunard invited me to experience the Queen Mary 2’s celebration of her 10th Anniversary (January 8, 2014) with a beautiful hand calligraphied invitation offering me a complimentary suite in Princess Grill, business class airfare, private transfers, a hotel, spa and internet credits plus a number of special events. As some say in New Jersey, “It was an offer I couldn’t refuse”. Added to that, I have always wanted to experience a winter Transatlantic Crossing. The reason for the invitation was, unabashedly, Cunard’s desire to better tap into the American luxury market and wanted to show me why Goldring Travel should recommend the Queen Mary 2 (and Cunard overall). In that regard, on this sailing there were twice as many British as Americans, though I suspect in the 15% of the Queen Mary 2’s guests that traveled in Queens or Princess Grill were even more so British. My Queen Mary 2 experience was truly an “experience” right from the outset. I arrived home from our family vacation late on January 1, 2014 with the Queen Mary 2 departure on January 3rd; leaving me one day in the office to get done what can’t be done online or on the phone…or so I thought. So I quickly packed, made sure the landscaper was taking care of the impending snow in driveway, and hopped into the sedan virtually flying into New York City as everyone is already hunkering down for the storm. The lobby in the Waldorf was chaotic as guests’ flights were cancelled and they had already checked out of their rooms. I eventually am greeted and am advised I have been upgraded to a magnificent suite in the Waldorf Towers. So as I sit in this huge suite with nothing to do I figure I would see if I could grab a taxi and visit my sister who lives uptown…and, bonus, my mother is visiting with her. The taxi driver is cautious as the snow is now really coming down, but I get there. And as we chat the word “passport” is uttered and I got a sickening feeling in my stomach: In the chaos I – yes me – forgot my passport! My brother-in-law came to the rescue as he had his 4x4 SUV parked right outside his apartment. Do you have any idea how impossible that is in New York City? But, fortunately for me, the impossible was possible. So at 10PM with the Governor Christie talking about closing the highways (can you imagine that?!) I was off on a 2.5 hour, snow-filled, drive back to New Jersey for my passport and then a 2 hour drive back to the Waldorf. Travel tip: Don’t forget your passport!!! 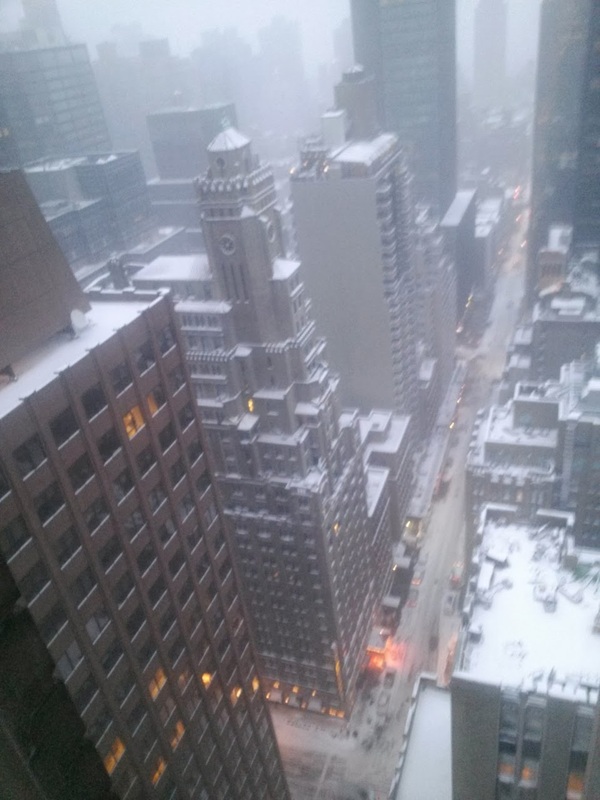 I awoke to a snow covered New York City and a very nice continental breakfast served in the Waldorf Towers…overhearing all of the travel nightmares facing most every other table. My car picked me up at 12:15 PM and I was off to the Queen Mary 2. But it took about 30 minutes to go the last half mile to the Brooklyn Cruise Terminal (and it was not Governor Christie’s fault!). For some reason there was a Perfect Storm and we are not talking about just the snow storm: Homeland Security decided it wanted to check everyone on the ship, including in-transit passengers heading back to Southampton AND the Centers for Disease Control decided it was going to do a surprise full inspection (The Queen Mary 2 scored a stellar 99 out of 100. Far better than my experience on Silversea’s Silver Shadow this past May.). Add to that the logistics of getting around the snow and it was a mess. There was absolutely nothing Cunard could do about that…but Cunard get huge credit for doing the absolute best possible! Now onboard I will change from my normal travelogue to more of an overall review of the ship, its service and cuisine…with a few stories thrown in as I had a fairly busy schedule of Cunard organized private events and I have been on the Queen Mary 2 before. My overall impression is that the Queen Mary 2 is a special ship in many ways; I truly enjoyed my winter Transatlantic Crossing and the ship’s evening formality with three formal nights, two balls (Black & White and Ascot), multitude of cocktail parties (Captain’s, Senior Officers’, Cunard Loyalty, etc. ), etc. From that standpoint the experience was definitely more British than American in flavor (though all purchases are in US Dollars). I enjoyed the teak and nicely cushioned lounge chairs, the Promenade where guests strolled in all sorts of weather, High Tea and the like. It was not until 20+ foot rolling seas did one feel any real ship movement. I, and others, enjoyed going all the way forward on Deck 3 Lower, sitting by the windows looking at the waves being sliced through by the Queen Mary 2’s beautiful bow. As the cold left, standing out on the Deck 7 promenade looking and listening at it was exhilarating. And, to be sure, sitting out on my veranda, with a glass of champagne, and my new down booties, bundled up enjoying the seas, sounds, smells and sunsets was more than memorable. My Princess Grill Suite was very nice, but I am not a fan of the layout or the finishes. While you wanted for nothing, there is no question that the layout and finishes are of higher quality on Seabourn, Silversea, Crystal and Regent Seven Seas. The weakest points are the location of the vanity desk is extremely close to the bed, so you cannot fully pull back the chair or exist the bed if someone is at the desk; the bathroom does not have a full sized tub and the wall and floor finishes are not of great quality combined with having only a single sink and limited counter-space. One curious note: With the beds put together there was no cushion strip covering the seam between the two beds, so you tended to sink into the crack. That makes no sense. Of course, none of these are “deal breakers”, but are of note. The Queens Grill Lounge is a very nice, comfortable, lounge with comfortable sofas and chairs. Your exclusive club is supposed to provide the best service while serving you High Tea, pre-dinner cocktails and after-dinner entertainment (such as a harpist or a string quartet). The first night I could tell the server in our section was more focused on those guests who had already been on, so it took almost 20 minutes to get recognized and then a cocktail. After that he was rather focused on “kissing up to me”, but that aside the service was appropriate. High Tea at 3:00 p.m.in the Queens Grill Lounge is a wonderful experience; the best at sea...as it should be on the British –heritaged ship. It is quite formal with white gloved service. The staff (far more than when cocktails are served) provide you with many tea options (no coffee) all freshly brewed and served by the cup in china tea pots. (Absolutely no tea bags here!). You are then presented with four courses: Finger sandwiches, Savory sandwiches, Sweets and, finally, Scones with clotted cream and jam. On a “cruise” this seems to me to all a bit much, but on a Crossing it is sublime as you have the time to truly enjoy it…rather than rushing to fit it in. Meals in the Princess Grill are sort of a mixed bag. The venue is elegant and the service is some of the best on the ship. However, I wish the cuisine matched the service as I wish the hours of operation did. Let me explain: In Princess Grill breakfast is limited to 8:00 AM to 9:30 AM; so if you are up early you are out of luck and if you are up at 9 AM or later you are as well. Lunch is similarly restrictive and, as happened to me, if you have an event ending at 1:30 PM you will find the Princess Grill closed. Huh? Dinner hours were fine. Service in Princess Grill was, overall, quite good. I did have an issue with the sommelier approaching me the first two nights asking if I wanted to order the same wine. I felt like saying, ”I am not ordering the same fish as last night, so why would I order the same wine?” Once that was sorted, there were no real issues with service. But there was regularly an issue with the cuisine. I never had a great meal. Some were OK (such as the Chateaubriand you need to order at lunch for dinner), but some were just mass market cuisine served on china with some flair. I found the fish (other than the salmon) was good. My beef tenderloin was bland and had a sawdusty texture. My grilled lobster tail was obviously boiled, left in the water (or a steamer) and then quickly placed on the grill for effect. The best dish was the pigeon. (While Cunard tried to arrange for me to dine in Queens Grill one night, it wasn’t possible. I have heard consistently that the cuisine is significantly better there.) As Princess Grill has its own galley, I find this hard to understand. I, of course, did my poached egg and hamburger tests. Poached egg: Very undercooked. Hamburger: Thin, overcooked and tasteless on a curious roll. But the Fish & Chips with Mushy Peas was excellent. Well, at least the fish was. The chips (French fries) onboard – everywhere - were sort of McDonald’s fries that had been sitting around…consistently. I dined at Todd English, the Queen Mary 2’s specialty restaurant twice. The first time was a private event and the food and service were excellent. (BTW, I sat next to one of the excellent guest lecturers, Tom Jones, an astronaut, and his wife. They were wonderful, charming, dinner companions…and made me quickly realize how little I actually know!) You have to try the Love Pillows (truffle-laced potato puffs). The food was so good that I went back the next night and, while the food did not disappoint, the service was the worst I experienced on the cruise. It took 20 minutes to get the sommelier’s attention and then 10 more minutes to get my wine. Of course, the wait staff was waiting for my wine to be served before taking my dinner order…and there you go. The Queen Mary 2 does have another alternative dining venue in the evening when they convert part of the buffet-style Kings Court into a sit down restaurant (Asian or other themed for the evening). I truly dislike the Kings Court from food to layout to smell, so trying that alternative dining venue was not happening; nor do I think most of my clientele would enjoy it. And that brings up one of the quirks of the Queen Mary 2 that reminds me of asking directions in New Hampshire: You can’t get there from here. If you are in Grill you cannot access most of the ship through public areas using those aft elevators unless you walk through the Kings Court or the closed (or open) Britannia Restaurant. You can walk down long straight passenger hallways, but it is a bit strange. Not a big issue, but a quirk. Having the time I tried to spend time in most all of the public lounges. One cannot talk about the Queen Mary 2’s venues without raving about the Queens Room. (I know. I know. It is confusing. Queens Grill Restaurant – exclusive. Queens Grill Lounge – exclusive. Queens Room – open to everyone.) On my last QM2 cruise I was with my son, so I did not take part in any of the cocktail parties or do more than quickly peak into the balls. This time I did and I really enjoyed myself there. If you sit back, take it all in, and look around at all the formality of the room and the guests, you virtually step back in time. Wonderful music, professionals and guests gliding along the dance floor, rich furnishings and artwork. Sir Samuels is the coffee bar (extra cost) where drinks are also served. Directly across from that is the Chart Room, which is a very pretty venue where jazz is played in the evenings until 12:30 AM. Overall the service is quite good in this lounge, but I did have one experience that truly shocked me. (And that takes a lot.) Without going into details, it was explained that some of the Eastern European wait staff is too strict and insist on following the rules rather than thinking from their heart (I like that phrase). The result is that small issues can become big ones. (Side note: I noticed that only about 30% of the staff said “Hello” or acknowledged me in any way.) Training. Training and Training. The Veuve Cliquot Lounge is nice. We had a wonderful private reception our first night and truly enjoyed this small comfortable lounge. Possibly because of the price point, however, there was more than one occasion I was going to stop in for a glass and there were no servers available. The Red Lion Pub is across from the casino. It is a nice, bright space, with the expected pub beverages (ginger beer, etc.) and a selection of pub foods available at lunch for no extra charge. You can watch UK sports on the large flat screen tv, play darts or listen to live music in the evening. For me a Pimm’s Cup would be perfect, but I was so busy I just never got around to it. The Commodore Club is high and forward on the ship. I like this venue and its piano player on the port side. What I like better is Churchill’s on the starboard side: The Cigar Lounge. There is a wide variety of cigars or bring your own. They will be properly prepared for you. There is sort of a small group that gathers there, so it is rather friendly venue…with everyone being just this side of unusual (me included, I guess). This is one of my favorite venues. (I must note that on the last night of the cruise, the staff was doing inventory right behind my head at 11 PM which was curious. We tried to hint that it was inappropriate, but they were oblivious. Should I mention that the person doing it was the same waiter from the Queens Grill Lounge that ignored me that first evening? OK, I will. One other venue was the disco: G32. If you wanted any lively activity in the evening this was the place, which picked up in activity after midnight. The band is fine, but the DJ had poor music and an equally poor attitude, as reported by more than one person. Note: The only way to get into G32 is walking through the very formal Queens Room. It is just a bit of a quirk, but if you don’t know this it will be a challenge finding the place. I was, honestly, shocked by this “18 and over” venue allowing an 8 year old not only on the dance floor, but taking over the microphone of the band on two nights. Comments were made on the first night, but everyone let it slide. When it happened again on the second night and it went on well past 1AM, the comments turned to complaints, which turned into outrage. The manager’s response was, “I have talked to them.” And then “I will have to ask them to leave.” And then “Well, you are telling me I have to call security.” Uh, yes. She never did call security, allowing this 8 year old and his parents to jeopardize G32 for two entire evenings at the expense and anger of many. Inexcusable. Another strange note: G32 closes around 3AM, but the Kings Court closes at 2:30AM, so there is no option for eating late night (and there is no pizza that late. Curious). Your only option: room service…who tells you it will be about an hour because G32 just closed. Huh? Just outside the Canyon Ranch Spa is the Wintergarden. To me this is a very comfortable, casual, but somewhat underutilized space on Deck 7. It is a great place to have a drink, gaze out the window and relax while listening to the trickle of the water fountains. Speaking of relaxing, I do enjoy the Canyon Ranch Spa. I was given a Day Pass for the length of the cruise so I could use the steam room, sauna and thalassotherapy pool. That was a nice touch as I bought one almost immediately after I boarded (refunded without question) because spending a few hours there every day on a Crossing is perfect. The staff was friendly, helpful and (hooray!) did not spend my time pitching me overpriced treatments and lotions I had no interest in. It made my experience in the Canyon Ranch Spa really wonderful. The Queen Mary 2 has numerous enrichment opportunities from afternoon knitting to computer and photography courses, to, in my case, lectures by an astronaut who, at the time, held the record for the longest time there and Concorde pilot. Their lectures were sophisticated and most certainly did not play to the lowest common denominator. Bravo. All of the staterooms are nicely finished and furnished. Even the standard staterooms have larger showers. The staterooms are another strong point for the Queen Mary 2. So with all of this, who do I recommend the Queen Mary 2 to? First, you have to distinguish between a Crossing and a Cruise. The Queen Mary 2 is an Ocean Liner; not a cruise ship; so there is a difference. It may be hard to distinguish the difference from what I have written, but alas they are different in design, style, approach and passenger mix. It is readily felt as you sail. If you are a luxury traveler, Queens Grill is truly your only option. Hitting on all marks for a luxury traveler is difficult, but in Queens Grill the Queen Mary 2 does hit most of them, from overall service, to cuisine to amenities to suites. Looking for an upscale experience or a suite experience without the premium of Queens Grill? Princess Grill most certainly fits the bill. If you are someone who wants to leave the gowns and tuxes at home, you most certainly can enjoy the ship and the crossing, but you will probably feel a bit out of place and, of course, miss much of the grandeur that the Queen Mary 2 uniquely brings to the high seas. Overall, I truly enjoyed myself and would happily board the Queen Mary 2 for another Transatlantic Crossing…maybe even during a time when the seas are calmer; though those seas and the Queen Mary 2’s handling of them really added something special to this Crossing.